How important are cognitive skills in escaping poverty? A Brookings Institution study tells us that cognitive skills are very important in escaping poverty. The green bar on the far left of this graph shows that 87% of children with the highest level of cognitive skills who grow up in the lowest income quintile move out of that quintile by adulthood. The orange bar for that same lowest quintile shows that only 46% of low-income children with the lowest cognitive skills escape poverty. Furthermore, the chances for these top-scoring poor children to become rich are the same as those of comparable middle-class children. … High-skill adolescents in the bottom quintile have a 24% chance of making it to the top quintile similar to the rate seen among high-skill students in the middle-income quintiles. Cognitive skills were measured using the Armed Forces Qualifying Test (AFQT). The study also found that conscientiousness, measured by the coding speed section of the Armed Services Vocational Aptitude Battery (ASVAB), is similarly associated with the ability of poor children to escape poverty. 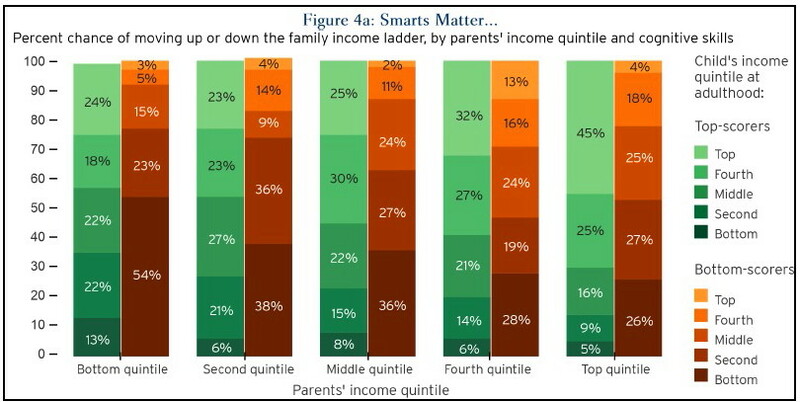 A college degree improves the chances “of upward mobility for smart, poorer kids”. … those with a degree had a 42% higher chance of making it from a lower-income household as a child into the higher-income bracket as an adult…. This data suggests ideas for policy changes, including one that would improve the opportunities for high-achieving children from low-income families to attend college. … Needless to say, adolescent AFQT and coding speed scores are far from a pure test of merit, or market ability. They simply measure certain skills that have developed up to the time of test taking. A whole host of factors—family background, formal education, and social environment—will have influenced this development. It is important to stress that our measures do not—cannot—capture innate levels of skill or ability. Dylan Matthews, “87 percent of poor smart kids escape poverty”, Washington Post, November 20, 2013. Richard V. Reeves and Kimberly Howard, “The Glass Floor: Education, Mobility, and Opportunity Hoarding”, Center on Children and Families at Brookings, November 2013.